The NASA EPSCoR program is directed to those jurisdictions that have not, in the past, participated equitably in competitive aerospace and aerospace-related research activities. Twenty-four states, the Commonwealth of Puerto Rico, the U.S. Virgin Islands, and Guam currently participate. Five federal agencies conduct EPSCoR programs, including NASA. 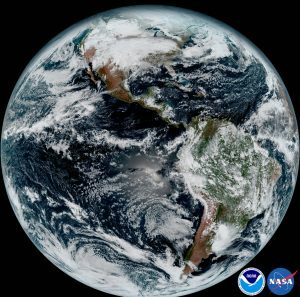 This composite color, full-disk visible image is from 1:07pm EDT on January 15,2017 and was created using several of the 16 spectral channels available on the GOES-16 Advanced Baseliner Imager (ABI) instrument. Each fiscal year, NASA publishes the NASA EPSCoR Stimuli report. Stimuli is a summary collection of college and university basic research and technology development reports impacting NASA’s earth science, aviation, and human and robotic deep space exploration programs. This document addresses research which is relevant to NASA’s mission, and currently administered by NASA EPSCoR. To view the Stimuli report, click here. NASA EPSCoR Research Infrastructure Development Awards (RID): This component enables jurisdictions to build and strengthen relationships with NASA researchers. The RID has a three-year base period of performance with a potential one-year no cost extension. Awards are $125,000 per year. NASA intends to announce the RID opportunity every three to five years, pending funding availability. NASA EPSCoR Cooperative Agreement Notice (CAN): These EPSCoR research awards solicit topic-specific proposals addressing high-priority NASA research and technology development needs. Awards are up to $750,000 for a three-year performance period. NASA intends to announce the EPSCoR CAN for research awards yearly, pending funding availability. NASA EPSCoR International Space Station, or ISS, Flight Opportunity Awards. Awards are up to $100,000 for a three-year performance period. NASA intends to announce the EPSCoR CAN for ISS Flight Opportunity Awards yearly, pending funding availability. 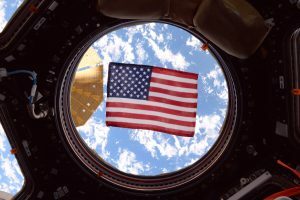 NASA astronaut Jack Fischer took this photograph of an American flag in one of the windows of the International Space Station’s cupola. In fiscal year 2015, NASA EPSCoR awarded 26 grants totaling $9.9 million to help bolster the capacity and competitiveness of 28 states and territories (jurisdictions) in the area of technology research and development. Through the EPSCoR program, NASA awards Research Infrastructure Development (RID) grants every three to five years to jurisdictions that have not, in the past, participated equitably in aerospace and aerospace-related research activities. The RID grants have a three-year period of performance, with renewal each year contingent on annual performance. Each awardee receives $125,000 per year with the exception of Hawaii and South Carolina, each of which receive $150,000 a year in order to also provide funding to the territories that fall under their program purview (Guam and the U.S. Virgin Islands, respectively). Previously funded RID awards, can be found here. In addition, in fiscal year 2016, NASA awarded approximately $8 million to 11 schools across the country for research and technology development projects in areas critical to the agency’s mission through the Cooperative Agreement Notice Awards (CAN). The NASA EPSCoR CAN program supports science and technology research and development at colleges and universities in areas such as remote sensing, nanotechnology, astrophysics, and aeronautics. All of these are applicable to NASA’s work in Earth science, aeronautics, and human and robotic deep space exploration. The schools received as much as $750,000 each for work during a three-year period. Previously funded CAN awards can be found here. NASA EPSCoR programs are managed in each participating jurisdiction by a program director, usually a faculty member of a university in the jurisdiction, who oversees the process of submitting grant proposals and the work performed with grant funding. Work funded by these grants must address areas of science and technology research and development that support NASA’s current and future missions. The information on this page, images, and additional information about the NASA EPSCoR program can be found here. Information about the Alabama NASA EPSCoR program can be found here.